A new frosted treat will take the limelight this Spring, as Chick-fil-A introduces Frosted Key Lime at restaurants nationwide starting Monday, March 18. 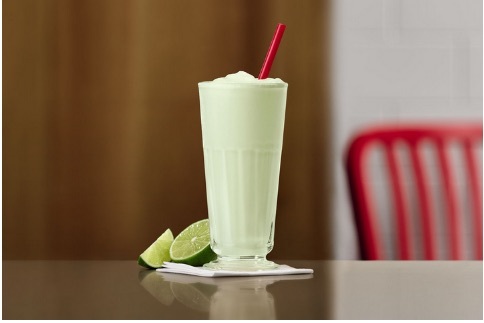 A fun, new twist on the chain’s lineup of frosted treats, Frosted Key Lime is a hand-spun combination of vanilla IceDream, Lemonade (or Diet Lemonade) and a natural, sugar-free lime flavoring made from a blend of key limes, kaffir limes and Persian limes. Chick-fil-A tested Frosted Key Lime in Austin, Texas restaurants this past fall. Positive customer feedback confirmed the decision to launch the treat nationwide. Frosted Key Lime is a delicious on-the-go snack or treat that is lighter than a milkshake and packs in superfoods such as spirulina and turmeric. Frosted Key Lime is available as a small, 16-ounce serving with prices starting at $3.25 and can be handspun with diet or regular Lemonade. Diet Frosted Key Lime (with Splenda®) has only 280 calories, while the regular Frosted Key Lime contains 350 calories. The new seasonal addition will be available in all restaurants Monday, March 18 through Saturday, May 25 or while supplies last.